Unlike any Linux distrubution, Microsoft Windows lacks number of utilities or tools that you will need from time to time. If you are IT professional, there are number of utilities you will need to get through your day in addition to what Microsoft Windows comes with. Thanks to open source methodology and licensing, number of these utilities are available free along with their source codes. And there are bunch of softwares available for Windows which are free but closed source which is totally fine as long as you don’t have to go through number of hoops to get your hands on the software. which doesn’t comes with adwares, spywares or other kind of hidden methods to make some profits from the users. which doesn’t require activation or registration after few days or otherwise some of the features will be locked down and so called ‘free’ app will be stripped down version of what you were expecting. Lets get started with our list of applications. The list below is not sorted out by popularity or functionality because why take extra headache of sorting and I will keep adding new apps in the future. Include number of tools to draw shapes and editing images. Provides history window with list of operations and supports unlimited undo operations. Plugin architecture allows you to download and load plugins developed by community. While Paint.NET is not as powerfull as GIMP, it still gives you a very poweful image editor with lot of capabilities of GIMP or any other graphics software while keeping the resource consumption to very low. This program consumes only around 30MB of memory when running on Windows Vista or XP. 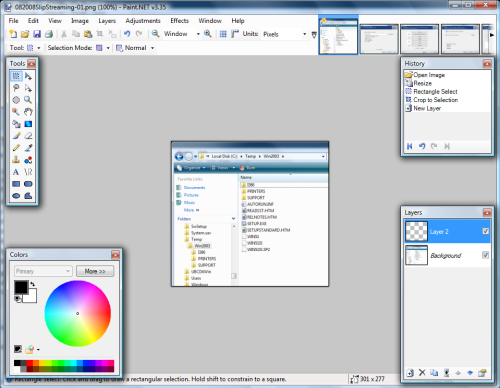 Below is the screenshot of Paint.NET in use. There is no doubt that Firefox 3 is the most popular open source software so far and the number of user for this browser is growing with each day. Its my default browser whether I am working on Fedora Core or Windows Vista. This new version of Firefox is much improved with faster rendering engine while reducing the computer resources consumption. Out of the box, it includes pop-up blocking, tab-browsing, integrated Google search and simplified privacy controls. The version 3 of Firefox has redesigned address-bar which is also known as ‘awesome bar’ will let you just type the word and it will display the list of URLs from browser history that include the typed word. It also has pull-down menus that includes bookmarks and history, a new add-on manager, the ability to pause and resume downloads, malware protection and a much better password manager. With thousands of add-on or plugins available from developers around the world, you can extend this browser to any limits. There is plugin available for pretty much anything you can ever think about. If you ever had to remotely login to Linux server, you know how much pain it could be if you don’t have Linux workstation with SSH client. One of the application which Microsoft Windows lack is SSH client and I was hoping they will have something with their so called ‘Powershell’ but unfortunately it lacks this feature. PuTTY is a free implementation of Telnet, RLogin and SSH for Win32 and was originally developed by Simon Tatham. Putty is standalone program which is only 444KB but packs lot of features in itself. Putty has connection manager so you can store connection details for later use. It also supports number of different encryption algorithms, X11 and SSH port fowarding. Below is the screenshot of Putty configuration window. WinSCP is open source SFTP (SSH File Transfer Protocol), SCP (Secure Copy Protocol) and FTP (File Transfer Protocol) client for Windows platform. The gaphical user inteface is very clean and user can select either Norton Commander like or Windows Explorer like interface. It also support Windows drag-n-drop feature for easy copy of files to remote server. It has built-in connection manager, support for multiple international languages, U3 and can synchronize directories in several semi or fully automatic ways. Two of the features which I really like about WinSCP is integrated text editor which let you edit the files remotely and second is the integration with Putty so you can lanch Putty SSH client with single click and you won’t be prompted for authentication again. WinSCP also let you extend the functionality with help of built-in scripting and plugins developed by community. 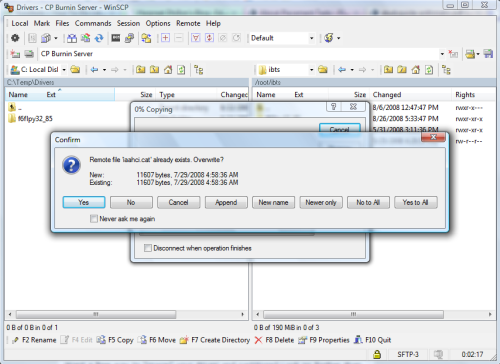 Below is the screenshot of WinSCP in action. If you are still using shareware version of Winzip which pops up with evaluation message every time you try to open a zip file, you will definitely like this application. 7-zip is open source application which supports number of packaging formats including 7z, ZIP, GZIP, BZIP2 and TAR. It supports even greater number of formats when it comes to unpackaging which includes RAR, CAB, ISO, ARJ, LZH, CHM, MSI, WIM, Z, CPIO, RPM, DEB and NSIS. Notepad++ is one application is always opened on my laptop/desktop and I dropped number of applications such as Notepad, Wordpad, Jedit, Notepad2, Nedit etc in favor of this editor. 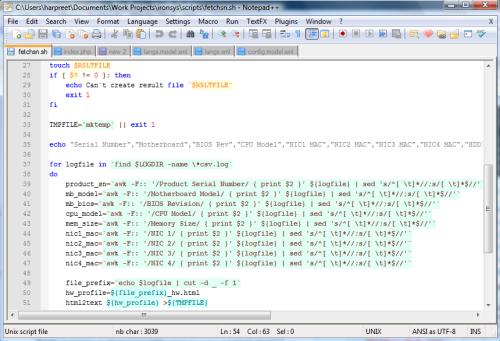 Below screenshot shows Notepadd++ in action. FTP Manager Lite is one of the best freeware FTP and SFTP client software. The clean interface is super easy to use. It will perform your files transfers quickly and efficiently. It is one of the best freeware FTP clients that also supports FXP.